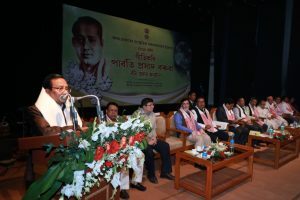 Assam chief minister Sarbananda Sonowal on Tuesday evening conferred the first Geetikobi Parvati Prasad Baruah on noted lyricist, musician, poet and litterateur Prof Idris Ali at a solemn and dignified function held at the Madhabdev international auditorium of Srimanta Shankardev Kalakshetra in Guwahati. Speaking on the occasion as the chief guest, chief minister Sonowal said that Geetikobi Parvati Prasad Baruah has enlightened the Assamese culture with his immortal creations. The motive behind instituting this award is to keep alive his invaluable creations for the new generation to take inspiration and get motivated, Sonowal said. Prof Ali in his well articulated acceptance speech said that by receiving the award, he got bonded with the great soul of the cultural icon for a lifetime. He recollected how during his formative years, he was inspired by the works of Parvati Prasad Baruah who is considered as one among the three pioneers of Assamese modern songs including Rupkonwar Jyoti Prasad Agarwalla and Kalaguru Bishnu Prasad Rabha. Prof Ali on an emotional note said that he never thought that he would one day be celestially bonded with someone whom he always revered and took inspiration in his way of life. The award carries a citation and a cash reward of Rs two lakhs. Speaking as the appointed speaker on the occasion, noted litterateur, intellectual, journalist and former president of Asom Sahitya Sabha, Kanak Sen Deka threw light on the life and times of Parvati Prasad Baruah, his struggles in life, her perseverance and his continued zeal to contribute to the life and culture of the Assamese community. 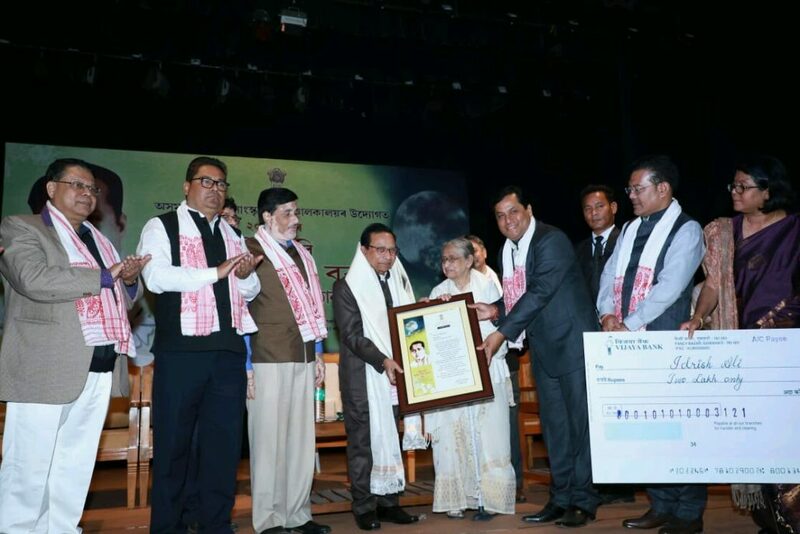 Deka also lauded the efforts of the Assam government and the department of Cultural Affairs for instituting this award thus immortalizing the great cultural figure of the State. Speaking on the occasion, state cultural affairs minister Naba Kumar Doley while reflecting on the life and works and Pravati Prasad Baruah said that it was the initiative of the chief minister to institute this award in an effort to immortalize the great cultural figure of the State. State power minister and legislator from Sonari, Tapan Kumar Gogoi spoke about his long association with the family of the great cultural icon. Gogoi in his speech took pride that the people of Sonari always wanted that the works of Parvati Prasad Baruah be always remembered by the State and expressed his gratitude to the chief minister in taking the initiative in instituting this award. What was heartening to witness was a host of former students of Prof Ali from Nagaon Girls College, where he served for more than two decades, spontaneously took the dais and felicitated their teacher on his receiving the prestigious award. The function was attended by host of dignitaries from the cultural, literary and social arena of the State, apart from the family members of Parvati Prasad Baruah.